Khalili, S., Lotfi, M. (2015). The optimal warehouse capacity: A queuing-based fuzzy programming approach. Journal of Industrial and Systems Engineering, 8(2), 1-12. Saeed Khalili; Mohammad Mehdi Lotfi. "The optimal warehouse capacity: A queuing-based fuzzy programming approach". 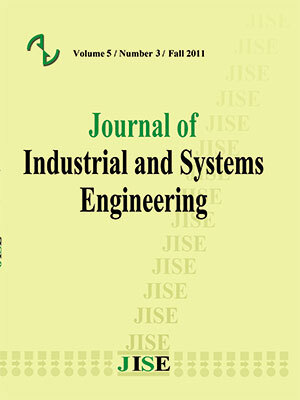 Journal of Industrial and Systems Engineering, 8, 2, 2015, 1-12. Khalili, S., Lotfi, M. (2015). 'The optimal warehouse capacity: A queuing-based fuzzy programming approach', Journal of Industrial and Systems Engineering, 8(2), pp. 1-12. Khalili, S., Lotfi, M. The optimal warehouse capacity: A queuing-based fuzzy programming approach. Journal of Industrial and Systems Engineering, 2015; 8(2): 1-12. Among the various existing models for the warehousing management, the simultaneous use of private and public warehouses is as the most well-known one. The purpose of this article is to develop a queuing theory-based model for determining the optimal capacity of private warehouse in order to minimize the total corresponding costs. In the proposed model, the available space and budget to create a private warehouse are limited. Due to the ambiguity, some parameters are naturally simulated by expert-based triangular fuzzy numbers and two well-known methods are applied to solve the queuing-based fuzzy programming model and optimize the private warehouse capacity. The numerical results for three cases confirm that unlike the previous approaches, the proposed one may easily and efficiently be matched with various lines of manufacturing environments and conditions. Ballou, R. H.,(1985), Business Logistics Management: planning and control: Prentice-Hall. Journal of Operational Research, 193(2), 425-436. Journal of Applied Operational Research, 2(2), 25-36. Operational Research, vol. 58, no. 1, pp. 3-13, 4/10/, 1992.
policy, IIE transactions, 28(2), 149-154. Pharmaceutical Industry–Plan or Outsource?. In Advances in Production Management Systems. Sciences Association of Canada (ASAC), canada; 30 (2). storage costs, Naval Research Logistics (NRL), 48(4), 299-312.
approach, Computers & Operations Research, 11(1), 13-18.
problem; a review of models and algorithms; Omega 31; 365-378. A nonlinear programming approach, Applied mathematics and computation, 175(1), 330-346.
problems, Fuzzy Sets and Systems, 49(2), 121-133.
of Operational Research, 108(1), 16-25. Rouwenhorst, B., Reuter, B., Stockrahm, V., van Houtum, G. J., Mantel, R. J., and Zijm, W. H.
of Operational Research, 122(3), 515-533, 5/1/. multiple objective supply chain master planning, Fuzzy Sets and Systems, 159(2), 193-214.